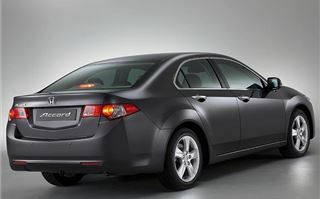 The 2003 Honda Accord has come to the end of its 5 year model cycle and been replaced by by a new Honda Accord for 2008. And it marks the beginning of the end for inefficient old 'slushbox' automatics. The secret of making a torque converter automatic work efficiently is a matter of matching gearing and lock-up with the torque characteristics of the engine. 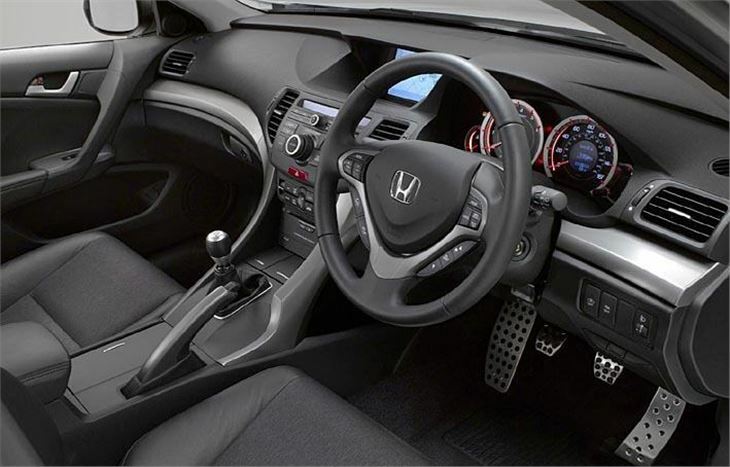 That’s why, according to Project Leader Hiroyuki Ikegami, Honda has been able to achieve better economy figures for its 2.4i petrol engined torque converter autos than for the manuals. 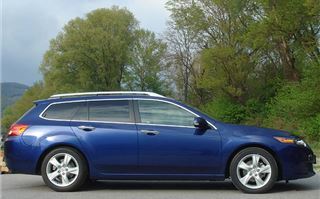 Better even than those for a twin-shaft transmission like Mitsubishi’s new SST. 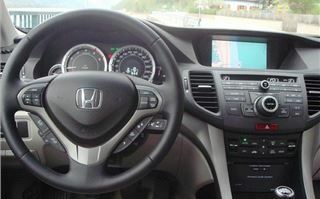 Honda hasn’t yet managed to perfectly match its 5-speed auto to the much narrower and stronger torque band of its new 150PS 2.2 I-DTEC diesel engine. Prototypes are running, though, and once Honda is happy with the CO2, economy and drivability, we’ll see this combination in the UK. A lot of thought has gone into the new Accord. You notice it in details like the fact the undulating dashtop does not reflect in the screen, the holes in the centre console are deep enough to hold bottles without interfering with your gearshifts, the reversing camera has the clearest, brightest screen display I have ever seen, the satnav controls are simple and intuitive, and the spoken instructions come from a voice that sounds like a combination of Joanna Lumley and Jenny Agutter rather than Miss Whiplash. We drove the diesel Tourer first, then the 2.0i automatic saloon, then, as a comparison, a rented Mercedes C200CDI Classic, and finally a 2.4i automatic Tourer. First impressions were of a big, solid car with very little mechanical, wind or road noise. Ikegami San explained much of this comparative silence was due to the flexible rubber mountings of the rear suspension subframe. The car steers more heavily and much more positively than the old Accord. 6th pulls about 35mph for every 1,000rpm. And the engine manages to be both quieter yet more punchy at the same time. 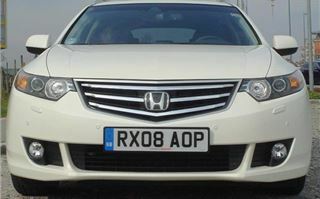 It’s not hard to get to grips with the Adaptive Cruise Control, Collision Mitigation Braking System and Lane Keeping Assist System. When fitted, CMBS comes on with the cruise control and basically stops you crashing into anything in front. It can be switched off, if you want to live a little more dangerously. 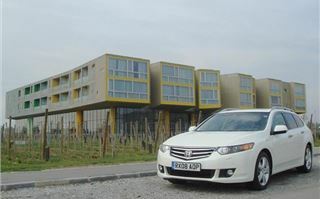 LKAS can be brought in by a switch on the steering wheel and uses a camera system to keep the car in the middle of the lane in which you are travelling. First developed on the Legend, it could be left to do all your motorway steering for you, but the lawyers said “no”, so instead it assists you to stay in lane rather than keeping you there by itself. 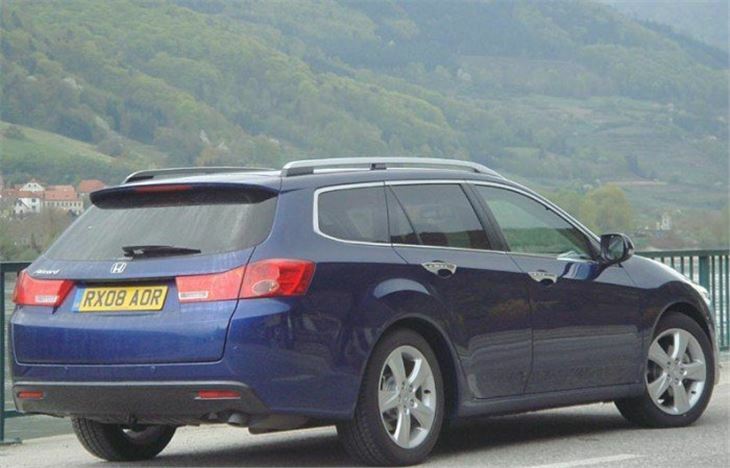 The perky rump of the Tourer no longer has the old Accord’s famously troublesome self-lifting power tailgate, now standard only on the EX GT. 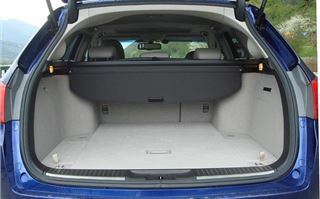 It does have a long, golfer-friendly load area with lots of cubbies underneath, yet, annoyingly, no spare wheel where you would expect to find one (though there is enough space for one). The luggage blind incorporates a dog net that rather fiddlingly clips into slots in the headlining. And something you notice when you get out to swap drivers is, you have not had to readjust the seats and steering wheel once. 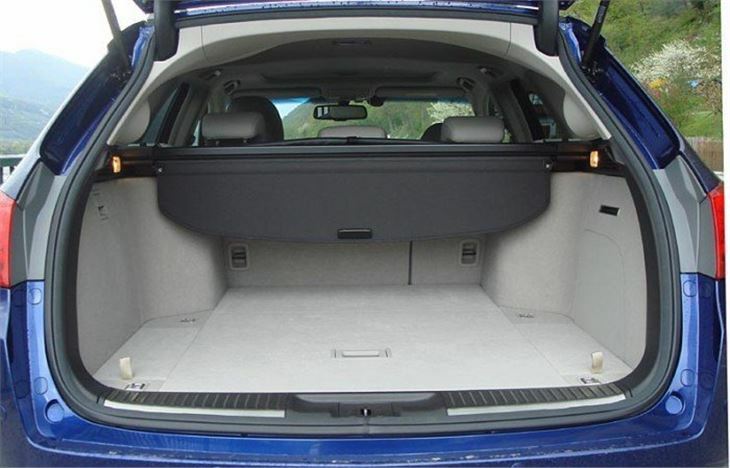 It’s a very comfortable car, with plenty of head and legroom for five, including piggy in the middle in the back. Next, a 156PS 2.0i auto saloon. This steered lot lighter and less reassuringly than the diesel, and felt a bit slow on the uptake as a consequence of the low CO2 automatic transmission mapping. But you can paddle shift it or lock it in Sport and kick down for 6,000rpm upchanges if you want to get a move on. 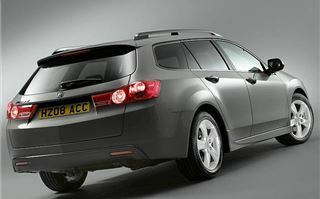 It’s still a fine car, but with a completely different character from the diesel. After that, Honda bravely offered us a choice of a new Audi A4 B8, new Passat, BMW 3-Series or Mercedes C-Class. I hadn’t actually driven a new C-Class before, so we went for that one. It turned out to be a very basic spec C200CDI Classic manual, a standard Europcar rent-a-car. Yet had a wonderful taxi-like, hewn from solid feel to it. The kind of car I could honestly imagine clocking up half a million miles. It handled well, too. 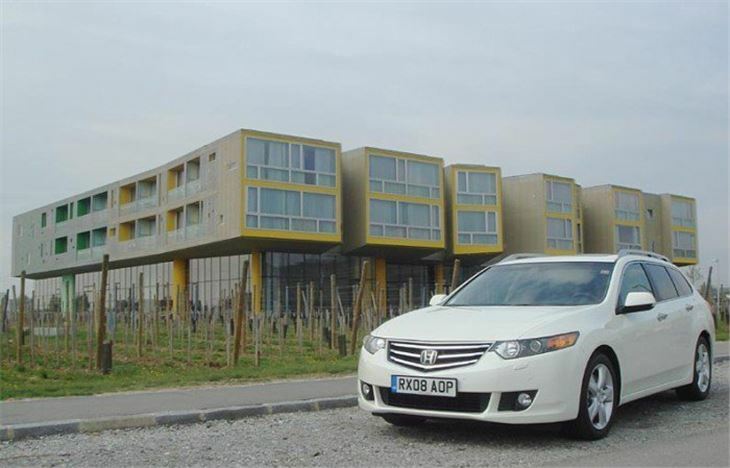 Yet, for the same sort of money, the Accord is a bigger, more imposing car, almost half way to an E Class. Lastly, a 201PS 2.4i auto Touring. Like the 2.0i, this steered more like the old Accord, feeling disconcertingly vague at high speed on long motorway sleepers. And, though it was quicker than the 2.0i and revved cleanly to 7,000rpm in kickdown, it didn’t go like it had 201PS, again the consequence of electronic control over the autobox that gives it better economy and lower CO2, but takes 9.3 seconds to reach 60 against the manual’s 7.5. 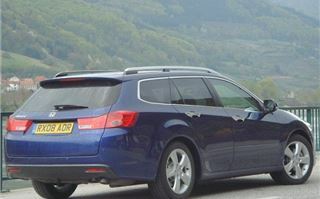 After the launch, on landing back in the UK, I climbed into the Subaru Legacy Boxer diesel I had driven to the airport, and that, of course, is another competitor to the Accord. Starting from cold, the engine sounded like someone was shaking an old metal bucket of bolts under the bonnet. 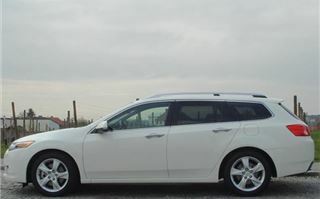 While the Accord diesel had the refinement of a recent graduate from finishing school the Legacy Boxer felt as if it had just been sent down to borstal. 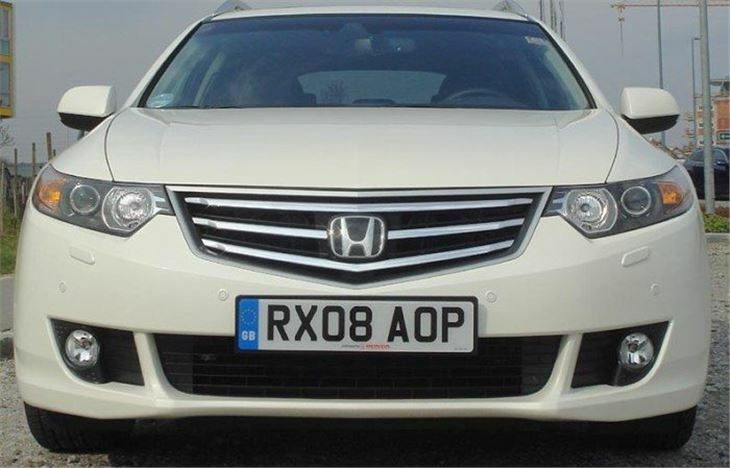 And, of course, the car itself is an older design, let down in details where the new Accord excels. Buyers in this category are spoiled for choice. The new Audi A4 B8 Avant, the BMW E91 3 Series Touring, the Passat, the new C-Class, the new Mondeo, the new Mazda 6, the new Laguna. The Accord is bigger than any of these except the Mondeo and Mazda 6, and despite those car’s qualities it feels the more solid car. No diesel auto in the launch range will lose a lot of customers it could have stolen from the 3-Series and C Class over the next 9 months. 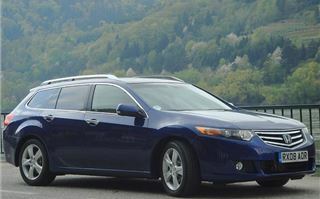 Though Honda would rather get that drivetrain right than put it out less than perfect. But I reckon anyone who makes the switch from a previous model A4, C-Class or BMW 3-Series will not be disappointed. 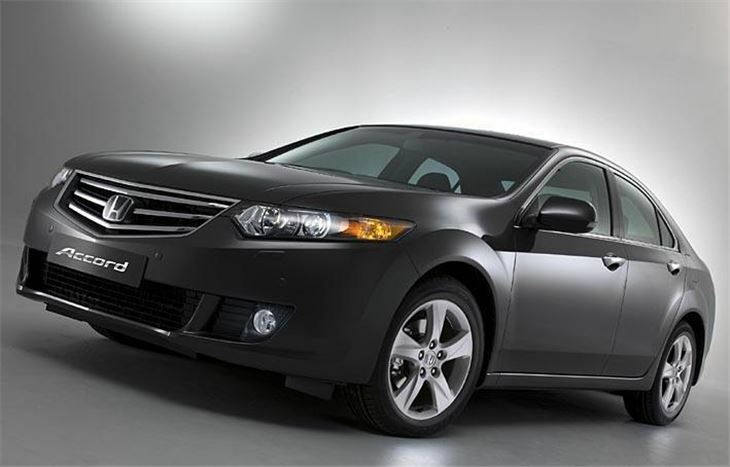 Nothing about the new Accord irritates. It’s a significant improvement over the old Accord which was already a seriously good car. And it’s a lot better looking, especially the Tourer. So I predict more conquest sales from Audi, BMW and Mercedes and very little traffic going the other way.